The image of these red trees against the waterfall backdrop is magnificent. Situated in the centre of the South Island, along the pass between Canterbury and the West Coast, Arthur’s Pass National Park is the third oldest national park in New Zealand. The main road between Christchurch and Greymouth (SH73) travels straight through the centre of the park. One of the world’s great train journeys – the TranzAlpine Express – also passes through the park, offering dramatic views of the mountains and plains. A signpost just north of the Chalet Restaurant points to the carpark where the walk starts. The track goes up the side of the Bealey River and over two footbridges before zig-zagging up steps through the mountain beech forest to the waterfall’s base. Return the same way. Temperate Rainforests can be found on the west coast of North America but the one I want to show you today is located on the other side of the Pacific. The lushness of the forest on Yakushima is what grabbed my attention. 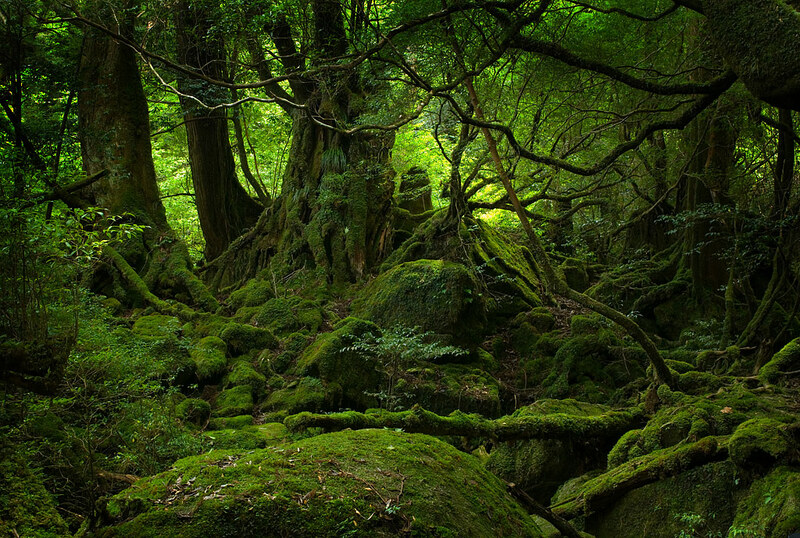 Some of the best preserved examples of forest are found in Kirishima-Yaku National Park on the Island of Yakushima off of Kyūshū in a very wet climate (the annual rainfall is 4,000 to 10,000 mm depending on altitude). Because of relatively infertile soils on granite, Yakushima’s forests in higher elevations are dominated by a giant conifer species, Japanese Cedar (Cryptomeria japonica), rather than deciduous forests typical of the mainland. Jōmon Sugi is the largest specimen of Japanese Cedar on Yakushima. The top photo is a common wallpaper image. I was not able to find out the name of the photographer. If anyone can help me with this, I’d appreciate it. The bottom image by Luke O’Brien. Check out his other wonderful Yakushima photographs here and here! Thanks once again to NASA’s Astronomy Picture of the Day for this amazing Photograph. Explanation: What type of cloud is that? This retreating cumulonimbus cloud, more commonly called a thundercloud, is somewhat unusual as it contains the unusual bumpiness of a mammatus cloud on the near end, while simultaneously producing falling rain on the far end. Taken in mid-June in southern Alberta, Canada, the cloud is moving to the east, into the distance, as the sun sets in the west, behind the camera. In the above image, graphic sunset colors cross the sky to give the already photogenic cloud striking orange and pink hues. A darkening blue sky covers the background. Further in the distance, a rising, waxing, gibbous moon is visible on the far right. You don’t have to go out of town to see some spectacular trees. A lot of the best trees are right in the city. This shot was taken in Central Park, smack dab in the middle of one of the world’s all time best Big Cities. New York, New York. The place so nice, they had to name it twice! I love Central Park. And I love these trees. 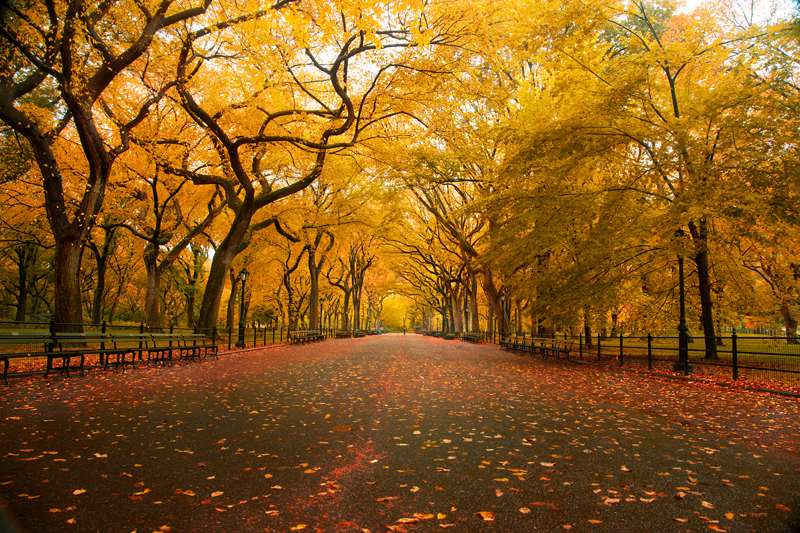 Being in Central park in autumn… the leaves, the colours… makes you feel like you’re in a movie. You expect to see Woody Allen or Ben Stiller or Meg Ryan & Billy Crystal just out of the corner of your eye. One of my favourite places in the whole world. How I would love to be standing on the Gapstow Bridge right now. Sometimes, it is not just one single tree that catches my attention. Every once in awhile, a forest captures my imagination. When I first saw this photo, I was reminded of the scene in The Lord of the Rings: The Fellowship of the Ring when the Nazgul were approaching the Shire. It’s the tunnel effect that really gets me. Beautiful but at the same time a bit eerie. Ashdown Forest is an ancient area of tranquil open heathland occupying the highest sandy ridge-top of the High Weald Area of Outstanding Natural Beauty. 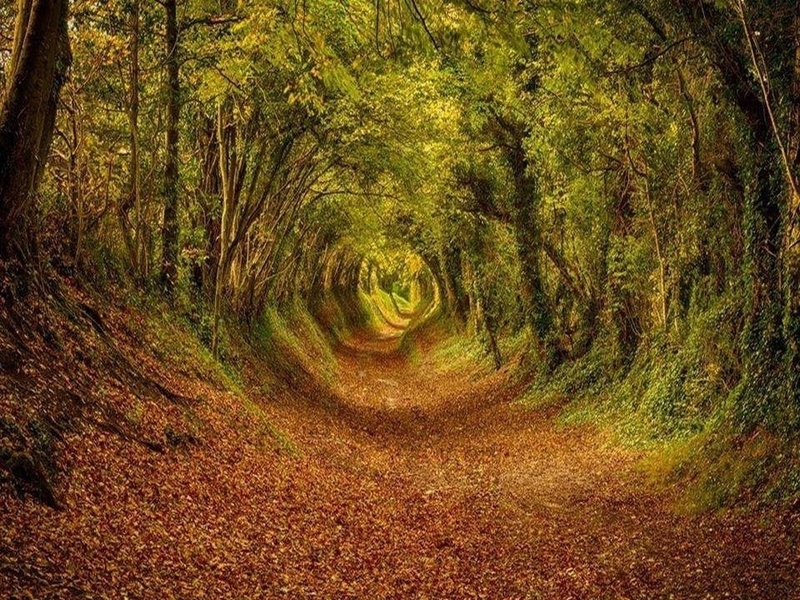 It is situated some 30 miles (48 km) south of London in the county of East Sussex, England. Rising to an altitude of 223 metres (732 ft) above sea level, its heights provide expansive vistas across the heavily wooded hills of the Weald to the chalk escarpments of the North Downs and South Downson the horizon. Explanation: An unusual type of solar eclipse occurred last year. Usually it is the Earth’s Moon that eclipses the Sun. Last June, most unusually, the planet Venus took a turn. Like a solar eclipse by the Moon, the phase of Venus became a continually thinner crescent as Venus became increasingly better aligned with the Sun. Eventually the alignment became perfect and the phase of Venus dropped to zero. The dark spot of Venus crossed our parent star. The situation could technically be labeled a Venusian annular eclipse with an extraordinarily large ring of fire. 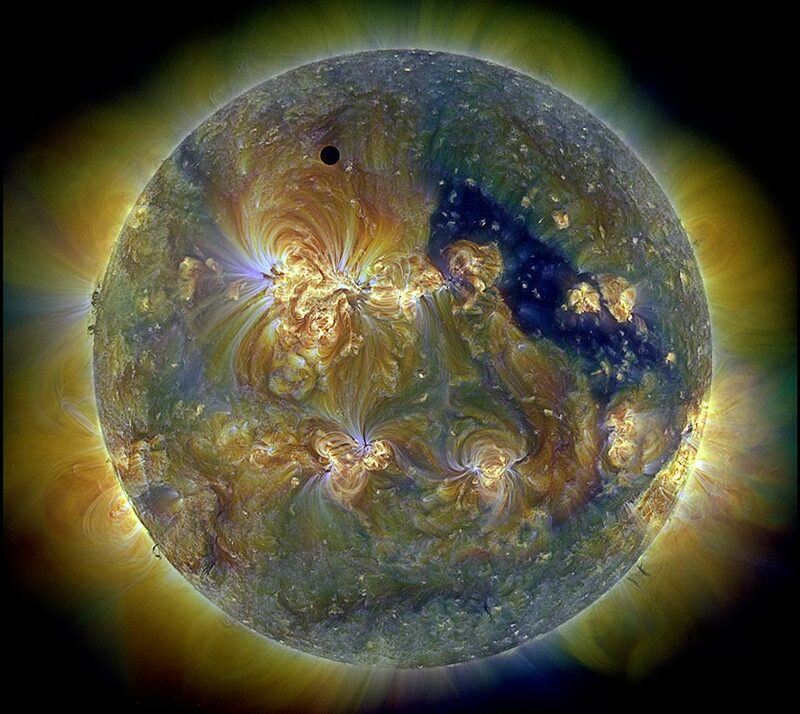 Pictured above during the occultation, the Sun was imaged in three colors of ultraviolet light by the Earth-orbiting Solar Dynamics Observatory, with the dark region toward the right corresponding to a coronal hole. Hours later, as Venus continued in its orbit, a slight crescent phase appeared again. The next Venusian solar eclipse will occur in 2117. Thanks, once again, to the amazing minds down at NASA for this mind-blowing image. Image Credit: NASA/SDO & the AIA, EVE, and HMI teams; Digital Composition: Peter L. Dove. I like trees in general but every once in awhile I’ll run into one that really takes my breath away. The first time I saw giant trees like this was in 1985 in Muir Woods in Northern California about 12 or so miles north of San Francisco. They must be experienced to be believed. No amount of description will do them justice.